CHICAGO (WLS) -- ABC7 Chicago featured a LIVE broadcast of Columbus Day Parade from 1:00 - 2:30 p.m. on Channel 7.2 Monday, October 9 and Sunday, October 15 at 2:00 p.m. on ABC7; ABC7's Alan Krashesky, Janet Davies hosted the parade along ABC7's Terrell Brown and Anthony Rago. Part 1 of the 2017 Columbus Day Parade, only on ABC7 Chicago. ABC 7 CHICAGO, the official station of the 65th annual Columbus Day Parade, presented the parade live, Monday, October 9, from 1-2:30 pm on ABC 7's 7.2 channel. (Comcast Channel 217, Wide Open West Channel 219, RCN Channel 618, Charter 608; Mediacom 723) and also streamed live at abc7chicago.com. Part 2 of the 2017 Columbus Day Parade, only on ABC7 Chicago. ABC 7 Chicago will also air the parade on Sunday, October 15 from 2-3:30 PM on its main channel. After the parade is broadcast, it will be available on-demand at abc7chicago.com. Part 3 of the 2017 Columbus Day Parade, only on ABC7 Chicago. 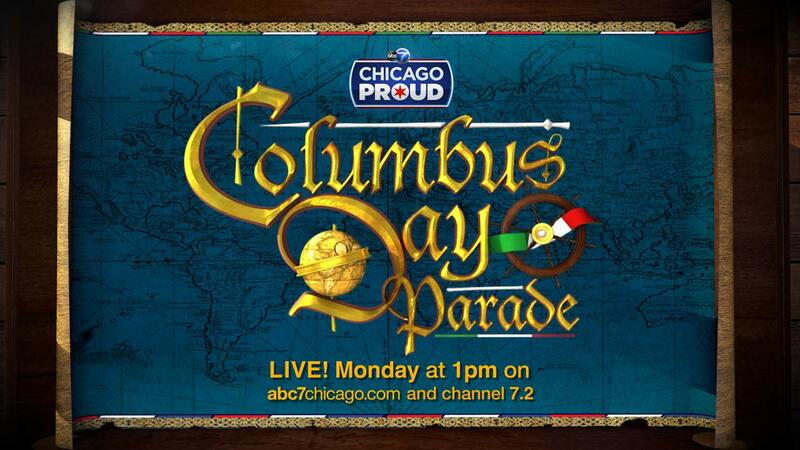 ABC 7 Chicago is the only TV station in Chicago to broadcast the Columbus Day Parade. Part 4 of the 2017 Columbus Day Parade, only on ABC7 Chicago. Alan Krashesky, ABC 7 anchor/reporter and Janet Davies, ABC 7 feature/entertainment reporter and 190 NORTH host, will once again serve to host the Columbus Day Parade broadcast. Anthony Rago, from Rago Brothers Funeral Home, and member of the executive committee of the Italian American Human Relations Foundation, will join them in the broadcast booth. Dominic DiFrisco, president emeritus of the Joint Civic Committee of Italian Americans will be one of the parade's special attendees. Terrell Brown, anchor of ABC 7 EYEWITNESS NEWS IN THE MORNING will be on the street capturing all the colorful festivities. Part 5 of the 2017 Columbus Day Parade, only on ABC7 Chicago. The 2017 parade's central theme is "Columbus around the World." The parade's honorary Grand Marshal is Gisselle Castillo Veremis, Consul General of the Dominican Republic in Chicago, Illinois. Part 6 of the 2017 Columbus Day Parade, only on ABC7 Chicago. Riding atop the ABC 7 Columbus Day Parade float was Kathy Brock, Judy Hsu, Jason Knowles and Diane Pathieu. Part 7 of the 2017 Columbus Day Parade, only on ABC7 Chicago. The fun started at 12:30 p.m. on State Street "that Great Street." The parade started on State at Wacker Drive and continued south to Van Buren. Part 8 of the 2017 Columbus Day Parade, only on ABC7 Chicago. The Columbus Day Parade Queen, 18-year-old Gianna Maria Tuminello, hails from the south suburbs. She grew up in New Lenox, Illinois and currently lives in Mokena. She is a senior at Lincoln-Way Central High School and plans to attend Bradley University as a chemistry pre-pharmacy student next fall. Gianna said, "Being Italian has helped me build my character. We have a loving, strong, and close family. I have never given up on my dreams...anytime I feel I am struggling with a challenge, I never lose my faith. I was born a Catholic, and my connection with God has made the impossible possible. I cannot be more thankful to be blessed with such a loving family." Tuminello was selected during a pageant sponsored by the Joint Civil Committee of Italian Americans. Part 9 of the 2017 Columbus Day Parade, only on ABC7 Chicago. The Great Lakes Navy Band led the parade joined by more than 150 units including marchers, bands, drum and bugle corps and floats. Part 10 of the 2017 Columbus Day Parade, only on ABC7 Chicago. The Columbus Day Parade celebrates Christopher Columbus and his monumental voyage which was first acknowledged in Illinois in 1963 when it became a legal holiday. The Columbus Day Parade is produced by ABC 7 Chicago.